I have been having issues with my pulsed-field gels showing good clear resolution at the top of my gel (145-291kb) and then blurry not so clear resolution towards the bottom (5-145kb). I use fresh buffer each run and have tried adding thiourea to both buffer and gel. I was wondering if I may be experiencing a "window" effect with my resolution, where I am getting different zones of resolution. My lambda marker does show uneven spacing that would correspond to this idea (i.e. crowding of bands at the top, good separation of bands at the bottom). If this is the case, I'm not clear on how to play around with my pulse times to fix this. Currently my pulse times are 1-25s and the gel is run for 19hr. Does anyone have any suggestions or ideas on what I could change? have you standardized the amount of cells to be taken, it seems from your gel that its varying a lot. 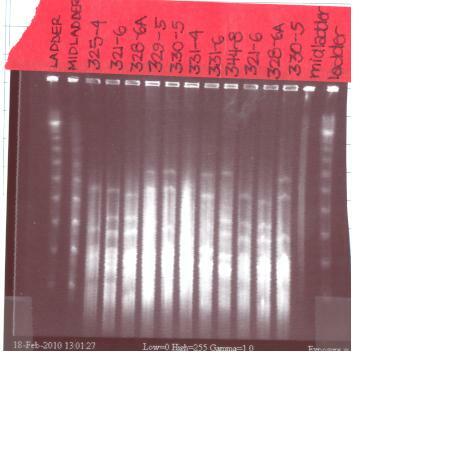 if initial cell numbers are optimum in sample, u will see clean bands, if it is more u will see degradation background. I hope you are staining the gel after electrophoresis and no EtBr during the run. I agree. This looks as if there is too much DNA in most of the wells. Decrease your cell density in the sample prep. Probably by 10x.